1.This PVC Greenhouse offers the perfect solution for those smaller gardens. It can protect your plants from too much heat or cold, shield plants from dust and gale, and help to keep out pests. 2.With proper care, this greenhouse will last through the seasons without tearing or cracking under the sun. No tools are required for assembly. 3.It has a strong metal frame and clear PVC cover with zips for easy access and ventilation. Inside with shelves, ideal for pots and seed trays. 4.Heavy duty durable powder coated steel poles, Longer life to use.Durable connectors,combined the whole frame quite well. 5.Double zippered front door,can be completely opened and rolled up, a bigger operating space and better ventilation. 6.Removable shelves, better space choice for your plants. 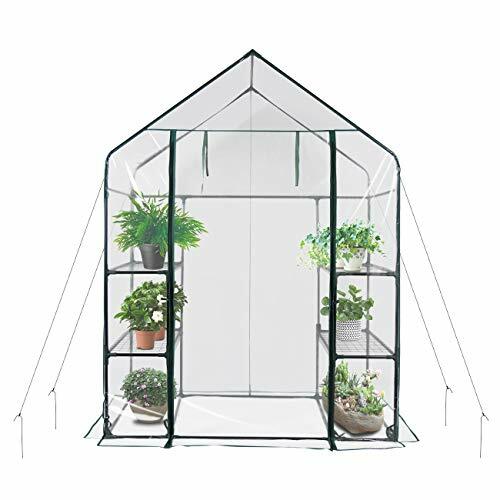 1.This 56"W x 29"D x 77"H mini PVC greenhouse offers the perfect solution for those smaller plants and creat a great greenhouse environment.Top shelf is more suitable for taller plants. 2.Heavy duty durable powder coated steel poles, Longer life to use. It makes you never worry about its weight capacity. This greenhouse has 17lbs Max Weight Capacity of every shelf. 3.Reinforced clear polyethylene plastic cover helps retain heat and prevents heat from dissipating.100% Waterproof, UV protection, maximum Solar Performance, keep the greenhouse inside warmer and help to extend plant growing seasons. 4.Double zippered front door,can be completely opened and rolled up, a bigger operating space and better ventilation.When the weather changes, it is convenient for you to transfer the greenhouse to the room. 5.Reliable and practical accessories enhance the stability of the greenhouse.include: Plastic Tie Connerctor,Frame Steel,Windproof Nails,nylon rope.Adequate inventory and Ships the same day.Excellent quality, trust worthy. If you have any questions about this product by Yijin, contact us by completing and submitting the form below. If you are looking for a specif part number, please include it with your message.